A KILDARE artist is hoping to raise €13,000 in a novel ‘Fundit’ programme in order to build a new wellness suite. Laura Barry has been running Florence & Milly, a community based pottery-painting art studio and coffee bar in Clane since 2015, and now hopes to expand it with “a wellness centre for mind, body and soul through art therapy, yoga, pilates, massage and pottery”. “Art is particularly effective for mental health wellness and it has been my experience that we learn to grow in personal autonomy through the medium of art,” said Ms Barry. In order to accommodate for the increased demand for art wellness, Florence & Milly are expanding the business by leasing the first floor of the same premise, which will be refitted and will be divided into two spacious, soundproof rooms, a large open space with seating area, and a small kitchenette. “We are asking people to purchase one of 12 rewards available on the Fundit project or to support the creation of the project. 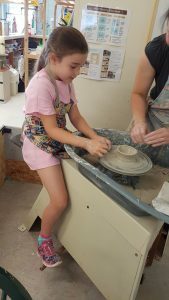 These range from pottery workshops, yogaramics, teambuilding workshops, pottery painting kits, vouchers, baby imprints and handmade ceramics from a limited edition studio collection,” said Ms Barry. All the money raised will go towards the project to refit and equip the wellness suites. They need to insulate the space, refit and soundproof two therapy rooms, equip with tables, chairs and materials, plumb sinks and heating, install smoke detectors and electrics. They also need a pugmill to reprocess clay, kiln to fire pottery, electric wheels and slabroller for therapy, classes and workshops. Laura has over 20 years’ experience dealing with the public. Having trained at Dun Laoghaire College of Art and Design, Public Relations Institute of Ireland and a Bachelor Science degree in Trinity College Dublin, along with qualifications in web design, Laura is a skilled communicator with a creative edge. Laura works alongside resident potter, Holly Parrow, a highly skilled, ex-commercial potter from the USA. Also, in the team are two undergraduates of NCAD, watercolour artist Brid óg Norrby, several therapists, fitness instructors and wellness coaches who wish to collaborate on this project.